Objects Of Affection: Something New...Unlock your Dreams! Just wanted to share a new little creation! I just listed it for sale on Etsy today! 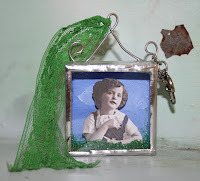 It is a little shadow box that has the sweetest little girl locked inside! I named the piece "Unlock your Dreams". Let me know if you think I should make more little shadow boxes!